This holiday send them a gift that they can enjoy throughout the whole holiday season. The magnificent holiday munchies gourmet holiday gift basket surely lives up to its name featuring a little sweet, a little savory and everything in between. 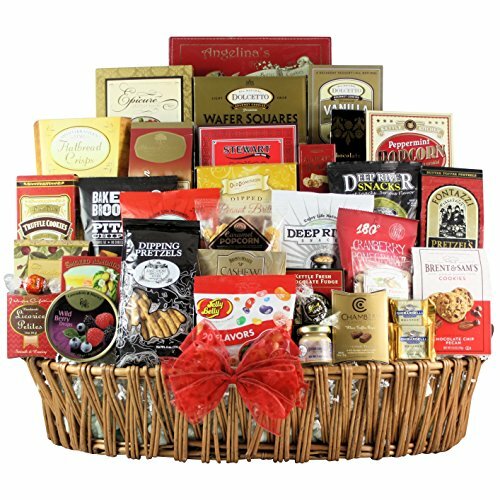 Includes Ghirardelli milk chocolate caramel premium squares, harry and David original dark chocolate moose munch, dolcetto vanilla creme filled wafers, primo Dulce chocolate truffle cookies, Millie lacs foods gourmet mustard assortment, comfort collection caramel popcorn and so much more. There's something for every taste in this exquisite collection of holiday favorites. This holiday send them a gift that they can enjoy throughout the whole holiday season. The magnificent holiday munchies gourmet holiday gift basket surely lives up to its name featuring a little sweet, a little savory and everything in between. Includes Ghirardelli milk chocolate caramel premium squares, harry and David original dark chocolate moose munch, dolcetto vanilla creme filled wafers, primo Dulce chocolate truffle cookies, comfort collection caramel popcorn and so much more. There's something for every taste in this exquisite collection of holiday favorites. View More In Candy & Chocolate Gifts. If you have any questions about this product by GreatArrivals Gift Baskets, contact us by completing and submitting the form below. If you are looking for a specif part number, please include it with your message. Small Praline (0.50oz) 100 Pack!